I do hope you’re in the mood for photos. If not, well… skim ahead to the text portions, because it’s a photo day here! I’ll lead off with the Charmed Knits beanie. The colors are a touch off; the blue isn’t so vivid, and the heather is a cross between the bronze in the books and the silver in the movies. It’s the small size, so it’s moving right along. When not in the study for its photo op, it lives on the arm of the sofa, so that I can garter stitch away while using my laptop. I hope to finish it up tomorrow or Monday, so it can be owled away as my first finished object for that worthy cause of a knit along. Next, we have the sock’s travel entourage. The book with the pattern within, my own Booga bag, in service as intended, toting a little project, and the sock itself, with its supporting cast of Inox teflon coated 6″ dpns, and the nifty little thingee from The Loopy Ewe to hold it all (yep, FIVE needles) together. (The Pampered Chef potholder didn’t travel. It is merely an aid to better display the colors of the Lorna’s Sheperd Sport yarn, also from The Loopy Ewe. The sock and its ability to travel kept me from acting like a bored eight year old as we shopped for a truck for the hubby. No, there’s nothing wrong with what he has, other than it’s not precisely what he wants, and as his sweet cousin (a manager at said dealership) tried to explain to me, my hubby just likes to get another vehicle every 3-4 years, whereas I am a “use it up” kind of gal. Now, mind you, I love trucks. I like what we looked at today. But… Never mind. This is a knitting blog, and the point is, the sock had its first road trip and we were both happy. There’s the happy young sock. You can’t see the four-row repeating pattern (beyond the cuff) so well, but you can see the great colors in the yarn, somewhat. Browns, dark mossy greens and a nice, strong blue… The stuff jeans and clogs dream of, or at least, mine do. Come fall, I’m going to have some happy feet, jeans and clogs. For what it’s worth, I couldn’t visualize shoving all ten points into those bright blue caps, but it’s not bad at all, and it worked like a charm. Believe me, we had lots of starts and stops. First, we had to make the 45 minute drive across the twisty-ist roads in two counties to get to the cousin’s house. Put away the sock. Then, switch to the cousin’s truck. No knitting, as I hadn’t seen the cousin in ages, and we all grew up together and always have much to say, even when we did see each other almost daily. Then, we arrived another 30 minutes later at the dealership. Looked at three trucks. Drove around. The sock got to see that part of the world, got tucked away for lunch, and then tucked away again for a return to the dealership… You get the point. That last paragraph was written with Mugsy in my lap. He thinks he should go truck shopping too, especially if the sock gets to go. He requires a lot of exercise and cuddling, and he got little of either today, so I need to wrap this up and take care of the poor boy. I doubt I get any traffic at all, but just in case someone wanders here unfamiliar with The Bag Lady, she’s having an exchange. Check it out and sign up! Before I begin answering, I must confess that I almost emailed TBL and told her she knows all the answers, so she could just fill it out for me. (Yeah, that’s the kind of friend I am.) However, she’s swamped at work, so I’ll be a good sport, even though she did have time to come up with a very long questionnaire! 1. How long have you been knitting? How did you learn? Well, that’s hard to answer. This go ’round, I’ve been knitting since very late November, 2006. However, I learned to knit as a girl, some 25-30 years ago. 2. What are your favorite yarns to knit felted bags with? The only thing I’ve used so far is Noro Kureyon. Liked the results, but the feel of the yarn while knitting wasn’t so hot. I have two other yarns in my stash for two more bags, but they keep getting pushed aside for more and more baby blankets. 3. What are your favorite needles to knit with? Hands down, no contest, my Knitpicks Options. Otherwise, metal is a must! 4. What are the last 3 bags you knitted (include URL for Yahoo! or flickr album or your blog if you have them!)? You can also link to patterns if you don’t have pictures of your finished objects! http://chanknits.blogspot.com I’ve only done the two bags; see post #2, in March. 5. Do you carry the bags that you knit, give them as gifts, or both? 6. What is your favorite felted bag that you have knit for yourself? The Chan bag, but I like the Booga an awful lot too. 7. What are your favorite colors? Do you like bags in these colors or choose other colors? Pinks, reds, greens, teals. Well, the Chan is done in greens/grays/teals, and the Booga is done in pinks, so I guess that answers that question. 8. Chocolate: White, Milk, Dark, or not so much? DARK. The darker, the better. 9. Coffee, Tea, or Milk? All of the above, but tea and milk much moreso than coffee. I need my mug of coffee after I get to work, then I drink green tea all day, and I have a big old glass of milk at night. 10. Do you prefer sweet or salty treats? What kinds? I’m not much on sweets except for chocolates. I’m not much on snacks, except for popcorn. 11. If you went into Bath and Body Works and could only come out with one item, what would it be and what would it smell like? Tiare Flower anything. Otherwise, anything Gardenia. 12. Do you enjoy any other crafts or hobbies? Do you collect anything? Scrapbooking, cardmaking, cooking, yoga, walking… I used to collect rooster (not to be confused with chicken) things for my kitchen, and long ago, I collected teddy bears. Now, I think I collect yarn and loose tea. 13. Are there any bag patterns you have not yet knit, but hope to someday? Anything entrelac. I like totes too. 14. What is currently OTN (on the needles) for you? Two different blue baby blankets. 15. What is your most recent finished object before that? A pink baby blanket. In my defense, they’re all different patterns, different yarns, and I have so many more to do, because it seems that a lot of my friends are expecting. 16. What’s cutest: Puppies, Piggies or Pixies? Puppies, but I am rather fond of my toes, aka: piggies, this time of year. I lurvers me sandals and a pretty pedicure. I lived on a farm, so the other piggies aren’t so cute to me. Pixies aren’t even on my radar. 17. Do you enjoy reading? Books, Magazines, or both? I have a stepson, not living with us. I also have two four-legged boys, both getting up there in years, Mugsy the crup/Jack Russell Terrier, and Fred, the Basset Hound. 19. What are some of your favorite yarns for other projects? I don’t know. I am almost obsessed with the need to learn to knit socks, but I have THREE baby blankets that must be done in the next couple of weeks. I also have cotton to do dishclothes too, but I don’t know when I’ll get done with blankies, and the two bags that want to be done. 20. And for the final question, one I see debated all over: Novelty Yarn: Love it! Hate it! or It depends! I’m not much on it, but I do have a fun fur scarf to do for my sweet mother inlaw. At least it will fly off the needles quickly. So, I’m learning. Comments are now welcomed; they were before, but I didn’t click something that needed to be clicked somewhere in the settings, so… Told ya’ I was new at this. Meet the crup. (For those void of Rowlinguistics, that’s a Jack Russell Terrier with magical talents.) He’s a reluctant model, but he loves his warm, handsome sweater. It’s a slightly modified Lion Brand pattern, as in his old age, he’s gotten a little chubby. (Round is a shape, thank you. He’s still plenty active and fit.) This was my first “it has seams” effort. Luckily, it only had four, short little seamed parts, and it’s not like he cares how they look. (Hooray for me! I just figured out how to put the photos where I want them!) This is another Lion Brand pattern, the felted needle case. 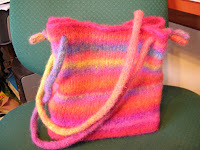 It’s lovely, and was my first felted project, as I didn’t believe I could manage a felted bag. The Bag Lady insisted, and I found a pattern with my name in it, so there was no choice but to give knitting in the round and felted bags a chance. Introducing the Chan bag. It’s done in Noro Kureyon, which is wonderful for its self striping, but the texture was weird and the thick to thin and back again was annoying. It was all worth it to have a tiny little bag that matched my outfit, held my keys, phone and credit card, and rested happily (and out of the way) in my lap, under my napkin through dinner and a speaker. And last, but hardly least, is my Booga bag, done in Noro Kureyon, colorway 102. I thought it was going to be a knitting bag, but it’s not big enough for the baby blankets I’m doing now. It’s a great bag for general use though, and I will probably use it as a purse in the fall, when wool seems more appropriate again. There’s one pink baby blanket done too, but there is no photo yet. One will have to happen soon, as little Helen came a few days early (last Wednesday, before blankie was done) so it must go off to be a useful little pink blankie soon. Happy now Bag Lady? Mugsy (the crup) isn’t. I must go sit on the sofa, hold him, and knit. But first, treat time.